The owner of a strong and bright voice Taisiya Krasnopevtseva, perfectly knows the technique of Russian traditional singing. Her repertoire includes a variety of authentic songs and spiritual poems collected in various parts of Russia on ethnographic expeditions. Traveling to the villages of Russia from early childhood, Taisiya took these songs directly from the bearers of the folk tradition. From early childhood, Taisiya Krasnopevtseva studied Russian folk song, sang in the choir, as well as solo. 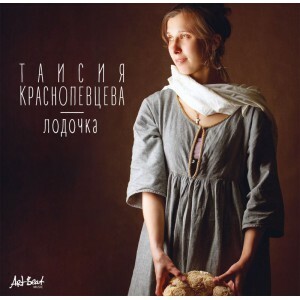 Taisiya participated in many Russian folk projects and groups. Here is a list of the bands and artists she worked with: the folklore ensemble Verenets, Inna Zhelannaya & Farlanders, Zhili-Bily, Bio Trio, Sergey Starostin, Sergey Klevensky, Sergey Filatov and Ethnosphere, Varvara Kotova and Polina Terentyeva. Many recordings with the voice of Taisiya Krasnopevtseva can be found by CD to the Sketis Music CD Shop. The album Boat was released in 2018 to ArtBeat label in simple cardboard envelope without any frills. The album recorded 12 songs with old Russian songs and spiritual poems. Some of the songs sound without any musical accompaniment (only Taisia’s vocals), where the wheel lira is used, but most of the tracks on the album have beautiful arrangements played on a six-string fretless bass by Sergey Kalachev (Grestel). Russian traditional songs and Grebstel`s bass involuntarily refer to the early recordings Inna Zhelannaya & Farlanders. There are no many bright parts on ethnic winds, there is no abundance of guitars and percussions. The album is heard in an airy, peaceful and slightly minimalist atmosphere. Modest and tasteful.